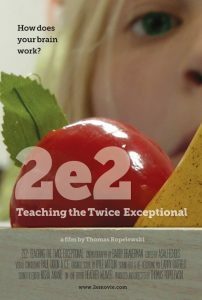 including Featurette The Students of 2e: Twice Exceptional: Where Are They Now? Additional Viewers Guides: available for $5.00 each (S&H included). This fee includes both DVDs and Viewers Guides and a one-site-specific license intended for K-12 public and private schools, libraries, parent-teacher, therapeutic and community groups and small health institutions. The license does not expire and allows 1) unlimited classroom use for the licensed institution only and 2) clubs and private screenings where fees are not collected. This license does not allow paid public screenings. This fee includes both DVDs and Viewers Guide and a one-site-specific license intended for public and private schools and colleges, universities and health institutions. The license does not expire and allows 1) unlimited classroom use for the licensed institution only and 2) clubs and private screenings where fees are not collected and 3) online streaming of the film for one specific course. This license does not allow paid public screenings. This fee includes both DVDs and Viewers Guides and a one-site-&-date-specific license intended for a single paid public screening event.